Direction test questions cover 1-2 marks in SSC CGL, CHSL exams, whereas 2-5 marks in Banking PO and clerk exams. It is also one of the easiest questions if proper rules and questions are practiced. The questions are meant to judge direction sense of candidates. Candidates have to trace the direction as per the questions or sometimes have to find distance covered or distance between the initial and last point. 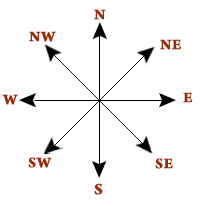 This direction chart has to be remembered and drawn while solving the questions. Follow the directions according to the questions have specified from the initial point to final point. 1. One morning after sunrise, Mohan walked facing a pole. The shadow of the pole fell exactly to the right of him. Find the direction he is facing? Ans: You know sunrises in the East. And, Mohan walked towards pole whereas the shadow of the pole fall exactly right of him. Case-1: If pole is in the North, and Mohan walks towards it. The shadow of pole will be on Left of him (Sun rises in the East). Case-2: If pole is in the South and Mohan walks towards it. The shadow of the pole will be on Right of him. Hence, case-2 satisfies it. The answer will be South direction Mohan is facing. 2. One day, Ramesh cycled 10 km southwards from home and then, turned right and cycled 5km, and turned right and cycled 5km, and then, turned left and cycled 10km. find the distance between his home and final point? and in which direction is the final point from his home? (i) Starting from A, Ramesh moved Southwards 10km. Then, taking the point B, he turned right, and then again right on point C and last, turned left on point D and reached at E (Final point). 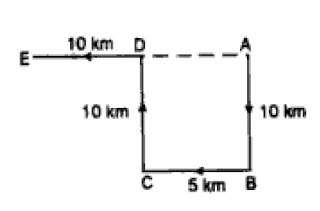 Since, the initial point is A and the final point is E, the distance will be AE = AD + AE = 15km will be the answer. (ii) You have to find the direction from point A. Draw the directions taking point A as the center as you have to find the direction of final point i.e. E taking consideration from initial point i.e. A. Hence, E is West to A. 3. Deepak walks 20 metres towards North. He then turned left and walks 40m. He again turned left and walks 20 meters and further he walks 20 meters after moving to the right. How far he is from his original position and in what direction? (i) Similarly, in this question again draw the direction as specified. Starting from the point A, Deepak finishes at point E. The distance between original position to final position is AE = AD + DE = 40 + 20 = 60 m.
(ii) The direction is to find from original position i.e. A and E lies to the West of A. 4. A is located to the West of B. 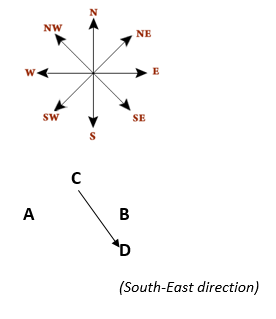 C is located at North between A and B. D is exactly to the South of B and also in line of B. 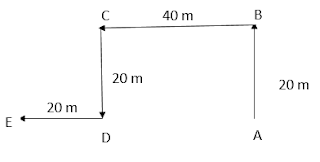 In which direction of C is D located? Place A,B,C,D as per the instructions given in the question after drawing the direction arrows to easily comprehend the question and find out the answer. 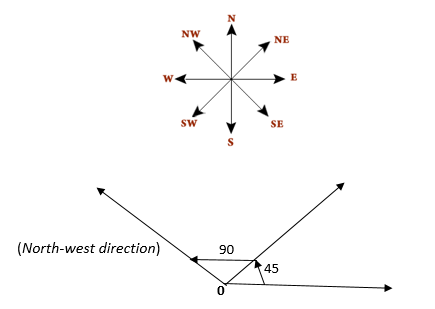 In question, the direction is asked to the respective of C. Hence, the answer is South-East direction. 5. Ravi is walking in the East direction. After covering a distance of 1km, he turns 45 degree left and then, 90 degree. In which direction is he now? 6. Veena and Veeru start from a point towards North. 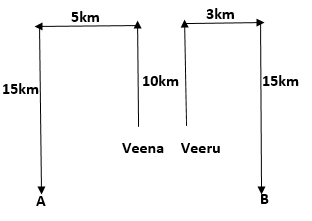 Veena turns to left after walking 10km. Veeru turns to right after walking the same distance. Veena waits for some time and then walks another 5km. Whereas Veeru walks only 3km. They both then return towards south and walk 15km forward. How far Veena is from Veeru? Tracing the path according to the question, the distance between Veeru and Veena is AB = 5 + 3 = 8 km. Comments "Tips for Direction test questions of SSC and Banking Reasoning section"